Quantitative Methods for Business 13 Edition You don't have to be a mathematician to maximize the power of quantitative methods. 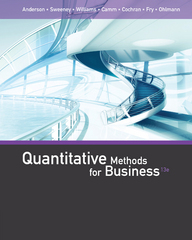 Written for the current?or future?business professional, QUANTITATIVE METHODS FOR BUSINESS, 13E makes it easy for you to understand how you can most effectively use quantitative methods to make smart, successful decisions. The book's hallmark problem-scenario approach guides you step by step through the application of mathematical concepts and techniques. Memorable real-life examples demonstrate how and when to use the methods found in the book, while instant online access provides you with Excel worksheets, LINGO, and the Excel add-in Analytic Solver Platform. The chapter on simulation includes a more elaborate treatment of uncertainty by using Microsoft Excel to develop spreadsheet simulation models. The new edition also includes a more holistic approach to variability in project management. Completely up to date, QUANTITATIVE METHODS FOR BUSINESS, 13E reflects the latest trends, issues, and practices from the field.